The official start of fall is just around the corner. I love the crisp air in the morning and the anticipation of all that fall brings. When the temperature starts to fall a little, I’m ready to make my first pot of soup for the season. 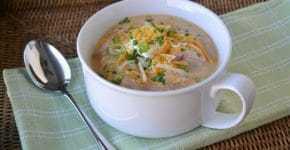 I tend to make heartier soups because in my family “soup is not a meal.” That is a quote from my husband, Dan. 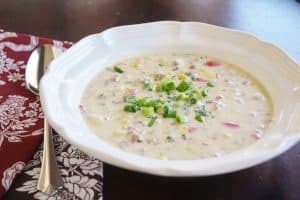 This Italian Sausage and Corn Chowder is a crowd-pleaser. If you are making this for kids or a crowd and you’re not sure if they like spicy foods, definitely use the Sweet Italian Sausage. But if you’re not afraid of a little heat, try the spicy sausage which makes it delicious. Cook sausage in a dutch oven over medium heat until browned. Remove sausage from dutch oven and set aside. Drain excess grease leaving about 1 tablespoon. Add onion and saute 3-4 minutes until tender. Add garlic and saute another minute. Add flour and cook for 1-2 minutes, stirring constantly. Slowly whisk in chicken broth and half & half. Bring to a simmer. Add thyme, basil, marjoram, oregano and red pepper flakes. Add red pepper, celery, carrot and potatoes. Return the sausage to the dutch oven. Continue simmering for 25 minutes or until the potatoes are tender. Add corn and continuing simmering 5 minutes or until the corn is tender. Ladle into bowls and garnish with sliced green onion. Pinned it- can’t wait to try this one. Another soup recipe to try one day! I’ve pinned for future reference and am now a follower of your blog. I’d love for you to stop by and check out my blog and link up to my Monday Party sometime. 🙂 Have a great weekend! I tried this recipe the other night, and it is delicious! I used the hot Italian sausage because we like some spice. This chowder will become a regular on our menu. Thanks so much Claudia! I love it with hot Italian sausage as well. Thanks so much for visiting our site and we hope you’ll come back!